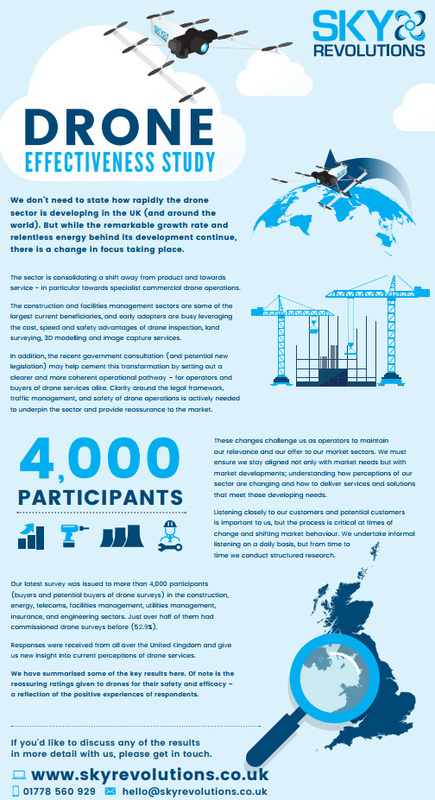 Leading construction companies, energy and facilities managers are seeking better drone governance. So say the results of Sky Revolutions’ first interrogation of the market. Their Drone Effectiveness Study was implemented to get a better understanding of what industry thinks of commercial drone services. The study, which touches on the recent government consultation (and potential new legislation), throws sharp focus on pilot competency and mandatory drone registration, suggesting a desire for enforced sector professionalism. And the rewards are great - when it comes to commercial drone services, the case for return on investment is obvious. Drones are faster, safer and more cost-effective than manual systems, and they can collect more data too. From large scale capital projects and major infrastructure surveys to single turbine and building inspections - asset managers, project managers, and maintenance personnel in-the-know are having a field day with drones. But with new market development comes that inevitable explosion in service providers – should buyers proceed with caution when it comes to employing drone operators? And are service providers clear how best to support those buyers? Sky Revolutions decided to go straight to their markets and ask the question directly – what do they think of commercial drone inspections, and what do they need from a service provider? Respondents were asked for their views on a range of questions from their perceptions of drones, to the support they need to make clear decisions. Key results can be reviewed in an infographic accompanying this press release. Sky Revolutions intends to repeat the study next year in order to monitor how market needs develop. Sky Revolutions is a leading surveying company and one of the first to realise the potential of commercial drone services. The company offers high quality surveying, aerial surveying, aerial photography and filming services across the UK Energy & Renewables, Construction and Mining, Utilities & Telecoms, and Facilities Management industries. Sky Revolutions brings significant knowledge from the construction sector to aerial surveying. Expert in building, planning and site assessments, Sky Revolutions uses its understanding of construction and maintenance to deliver valuable and contextual insight via some of the world’s most sophisticated Unmanned Aircraft Systems (UAS). This combination of construction expertise and advanced drone or UAS proficiency has seen the company attract the attention of some of Europe’s largest maintenance, utilities and facilities management experts. It employs a team of highly trained specialist pilots and support staff to deliver a new cost-effective, safer and accessible means of surveying at height.